Enviromesh undertakes design evaluations to assist Engineers, Architects and Contractors in the preparation of gabion applications. To complement this service or allow clients to prepare their own designs, Enviromesh has compiled a series of 3 design and product guides to assist specifiers with this process. These guides are available for download below. 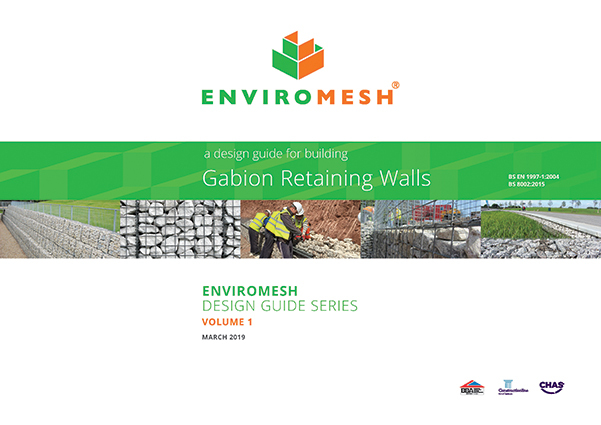 This publication describes the types and specifications of gabion systems currently available from Enviromesh. Assembly and installation guidance is explained fully, along with the principals of the design methods and analysis in accordance with BS EN 1997-1:2004 & BS 8002:2015. With additional information regarding soil characteristics and gabion fill materials, this comprehensive document offers clear guidance to the industry. Expanding upon the applications from traditional mass gravity walls, this publication details the various alternative uses for gabions such as rain screen, cladding to buildings, decorative cladding to sheet piling and RC walls, freestanding walls and architectural structures. This document returns to civil engineering applications. Typical uses of gabions and gabion mattresses for river and erosion protection are covered, including applications such as headwalls, cascades, weirs, revetments and scour protection.